And thankfully, Rod Stewart won't be in sight! Sorry, Rod! After years of preparations & secrecy, the 2010 Vancouver Winter Olympics will kick off in grand style this evening. I CANNOT WAIT! 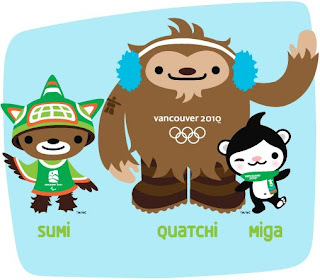 The cute mascots, the fantastic winter sports, the spirit of cheering for your country -- and it's all in CANADA this time! Rumours have been circulating like mad about who will be the final torch bearer -- everyone from Wayne Gretzky to Betty Fox have been touted -- and the mystery just gets more and more enthralling with news that both Walter Gretzky (yep, the Great One's beloved Dad) and Rolly Fox (wife to Betty, and father to our greatest Canadian, Terry Fox) have been torch runners today. Petitions on the web, on Facebook & elsewhere have been flying for months hoping to add fire to the campaign to have Betty Fox bring the torch to its final home in Vancouver. If the rumours are true, there won't be a dry eye in the place - or in my home. I'm stocking up on tissues just in case. I'm looking forward to the games! Watching right now, but it's just talking heads. Bring on the Opening Ceremonies!